Typically, patients with Type 1 diabetes use insulin pumps. But, there are some instances in which a pump is an option for someone with Type 2 diabetes as well. 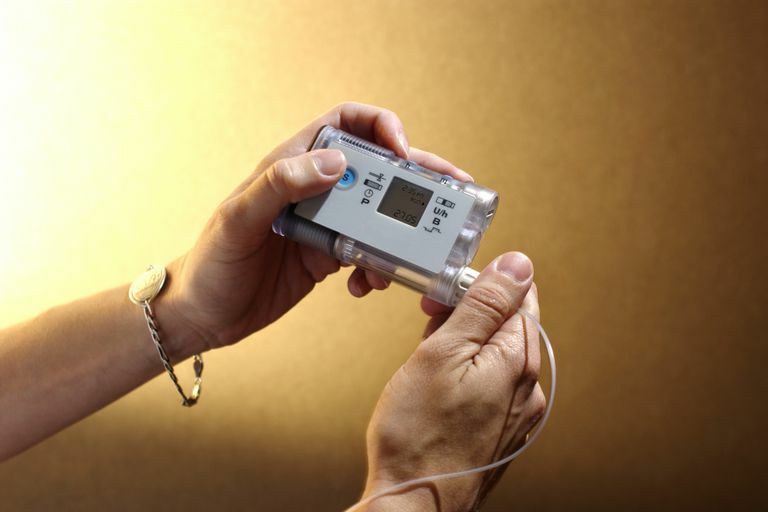 Research suggests that insulin pumps are useful for Type 2 diabetes patients with severe insulin resistance and poor glycemic control despite sufficient insulin titration and adherence to recommendations on diet and exercise. However, there are certain guidelines that should be followed for quality and safety purposes. If you have Type 2 diabetes, you can't and shouldn't automatically get an insulin pump. In order to be eligible for insulin pump therapy, persons with Type 2 diabetes should be on multiple daily insulin injections daily (at least 4/day). Secondly, you may be a good candidate for a pump if you experience frequent hypoglycemia (with insulin injections), have advanced complications of diabetes, or frequent blood sugar excursions (high sugars). Before being introduced, it is recommended that you monitor your sugars about four times a day or more. The reason for this is there will be a lot of fine-tuning of insulin doses when you start a pump. And the use of insulin increases your risk of hypoglycemia. You should also meet with a Certified Diabetes Educator regarding the management of an insulin pump. An insulin pump is a small, pager-sized device that delivers a continuous dose of insulin through a cannula to cover your baseline or background insulin needs. When you eat food that contains carbohydrate you will have to deliver a bolus of insulin via the pump based on the amount of carbohydrates you've eaten. It is important that you understand how to physically operate the device so that you deliver the right amount of insulin. You will have to understand carbohydrate counting, too, because insulin doses for meals are dependent on how much carbohydrates you've eaten. You will receive something called an insulin-to-carbohydrate ratio. The insulin to carbohydrate ratio will determine a specific amount of insulin based on the carbohydrates in your meal. For example, if your insulin to carbohydrate ratio is 1:10 that means you need one unit of insulin for every 10 grams of carbohydrates eaten. Therefore, if you eat 40g of carbohydrate you will bolus 4 units of insulin. There are many features on the pump that can help you control your after meal sugars based on the types of foods you're are eating. You will also be able to take extra insulin if needed to lower a sugar (referred to as a correction). Many pumps contain carb counting helpers too. You can discuss specific features of pumps with your healthcare team. Again, insulin pumps are not meant for all patients with Type 2 diabetes. Newly diagnosed patients, patients with well-controlled diabetes on oral medications or those patients with prediabetes are not good candidates for pump therapy. Also, those patients on very large doses of insulin should not be prescribed an insulin pump. If you are someone who needs to take more than 25 units of insulin for your meals, then a pump is not for you. Insulin pump reservoirs are filled with fast acting insulin, but depending on the pump the reservoir can hold on average anywhere from about 170-300 units of insulin. Lastly, patients with dementia, physical or mental inability to use an insulin pump is not recommended for insulin pump therapy. First, call your insurance company to see which pumps it covers. Some insurance companies have preferred pumps. Once you get an insulin pump, it is yours for several years and you cannot switch until you are due for an upgrade (unless you want to pay for it). Next, discuss with your healthcare team; ask to be educated by a Certified Diabetes Educator. Insulin pump companies hire clinical specialists, such as Certified Diabetes Educators to do pump training and start-ups. Be patient—these things take time and they should. If you do not operate a pump properly, you can find yourself in dangerous situations. It is worth it to be properly educated. Diabetes Forecast. Consumer Guide: 2014. Insulin Pumps. Reznik, Yves, MD & Cohen, Ohad, MD. Insulin Pump for Type 2 Diabetes. Use and misuse of continuous subcutaneous insulin infusion in type 2 diabetes. Diabetes Care. Texas Department of State Health Services, Diabetes Treatment Algorithms for Insulin Pump Therapy, Supplement, 1-34.